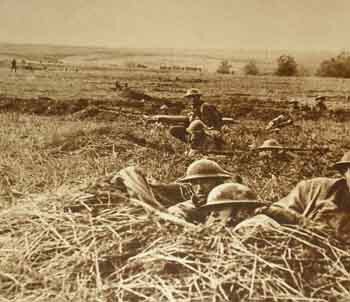 American troops in the field during World War I.
TAMPA, Fla. -- University of South Florida students, faculty and staff as well as members of the public are encouraged to register now for the World War I centenary conference on Feb. 6-7, 2015. The conference, which is sponsored by the USF College of Arts and Sciences and the Department of History, will be held on campus in the USF Patel Center for Global Solutions (CGS). This conference is ideal for university professors, high school teachers, college students and those who enjoy WWI history. The conference features the greatest assemblage of world-renowned World War I experts who will share the impact the war had on the United States and the global community. The speakers will discuss a variety of topics that range from American airpower in 1918 to Russian, German and French involvement in the war. Noted World War I expert and accomplished author Graydon “Jack” Tunstall, who is an instructor in the Department of History, is organizing this conference. “The conference brings together an unprecedented panel of experts to discuss the war to end all wars,” Tunstall said. Tunstall’s lecture will focus on the effect of WWI in the Middle East, Asia and Africa. The United States’ involvement in WWI officially began in 1917, just three years after Great Britain and other Allied powers declared war on Austria-Hungary and Germany. Both sides used chemical weapons and trenchwarfare to maximum effect. The battles were bloody and brutal, and more than 100,000 American soldiers were killed before the war ended in November 1918. Registration is open until Feb. 5, 2015, and includes speaker sessions, lunch on Feb. 6 and book signing opportunities. The cost is $165 per person. A reduced rate of $60 is offered to OLLI USF, Tampa Bay History Center and USF Alumni Association members. Current USF students and faculty are free; however, lunch is not included and they must register. Students who are enrolled at other universities will be charged $90, which includes lunch. To find out more about the speakers, on-campus parking and upcoming registration deadlines, visit the conference website. Other conference sponsors include Phi Alpha Theta History Honor Society, Inc., World War I Association and OLLI.